Rome, 10 BC: Caesar Augustus has erected a mighty obelisk in the center of the Circus Maximus in tribute to his conquest of Egypt. Banners of the Red, White, Green, and Blue factions wave in the stands as the fans cheer on their favorite drivers and teams. Here will be tested the skill of the drivers (aurigae) and the caprice of the gods. There can only be one victor! The chariots are taking their starting places, and soon, the thunder of numerous quadriga, four-horse-drawn chariots racing at breakneck speeds, will echo among the crowd of 250,000. 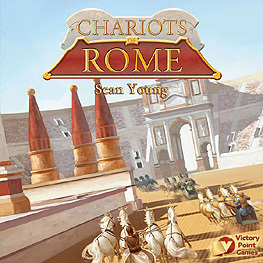 Chariots of Rome is a simple (yet brutal) competitive, chariot-racing board game for 2 to 8 cunning drivers set in ancient Rome's grand stadium, the Circus Maximus. Each player controls a unique charioteer competing on the giant track for two or more laps. Players can also drive with one of four teams (of two chariots), each representing a different Roman faction. But there is more to winning the laurel wreath of victory than just handling dangerous corners! Charioteers can whip and ram their opponents to hinder them during the race (much to the crowd's delight). The gods are watching, too, along with the tens of thousands in the crowd, and they may be inclined to influence the race in their favor! So mount your chariot, tie the reins around your waist, tightly grasp your whip, and pay tribute to Caesar in Chariots of Rome!